First, we can't thank the 27 folks ENOUGH who came out and made this project happen. They include: Doug Bailey (he's the main guy that made this happen - thanks Doug! ), Erik Bolig, George Harman, Emory Ehrenfeld, Joe Ketrick, Dale Shomper, Alan Murak, Rick Begley, Matt Hollenbach, Mike Kuhn, Keith Whitcomb, Chris Jones, Saysana Inthauungsa, Joe Daversa, Clayton Bouchard, Jason Petroff, John Haines, Fred Bellis, Brian Despot, Martha Ruff, Joe Lauver, Steve Miller, Kory Jones, Ed Hidden, Shawn Withers, Rick Brown and Jill Wiest. A special thanks to Ed Hidden for the below YouTube Video. It's heartwarming to see the teamwork and hardwork that went into dismantling, moving, and reassembling the bridges. Here's the You Tube Vid, courtesy Ed Hidden. And here are Rick's Pictures. Definitely worth a look along with the You Tube Vid by Ed. In both these cases, a picture is worth a thousand words, fer shure! Little ole' Rattling Creek has its 10 minutes of fame - an IMBA Epic. Heck, even Keith is mentioned in the article - so that means he's famous too! IMBA talks about the trails being a labor of love, and they truly were for many years. You can read the entire press release here. 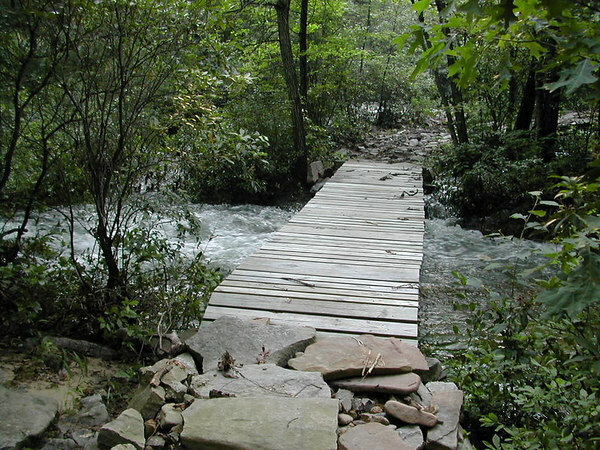 Since everyone loves these trails so much, please help us bring the bridges back. DECEMBER 4 - 10:00 am - meeting at the Rattling Creek end of Doc Smith Trail. BRIDGE RETRIEVAL DAY. Thanks to a couple locals (Doug, Clayton) and a fellow SAMBA rider (Kory), the effort to retrieve the bridges is alive and well and planned for December 4. We need manpower to make this happen. Below is what was discussed to get the beams back in place. Be prepared to get wet feet -- bring a change of clothes. 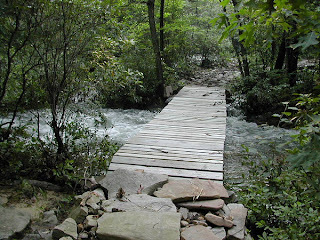 And of course bring your bike to ride the "Epic" trail system afterwards. Please let us know if you can make it: rebjsw@epix.net We need a head count to make sure this can happen. We discussed a possible method using sets of straps as hand holds allowing one person on each side of a strap to lift or drag the beams out of the creek and back up to a location on the far side of the creek along the original trail. We are looking into how to fashion sets of straps or ropes with hand holds to allow many people lift or drag a beam. Doug had also mentioned how they use small diameter logs under the ferry boats when they move them out of the water and onto the shore for winter. We thought that we may be able to work something like that out to help us drag the beams back up the makeshift trail I cut some weeks ago. If nothing else, placing short sections of logs under the beam while trying to move it will allow it to slide over the ground and not get hung up on everything. The distance the beams need to be moved is short enough that we feel this method of lifting or dragging with straps or ropes may be able to be used. We are putting the finishing touches on the itinerary for the weekend and will post to this blog and send via e-mail to all registrants when ready. In a nutshell, same as prior years: a live band Friday AND Saturday evening, beverage exchange friday evening, beverage wagon saturday evening, Gonder's Grubhouse chicken/vegetarian dinner on Saturday evening, swag drawing Saturday evening, etc. We will NOT be having the chili cook-off on Friday evening. Instead, we will be inviting folks to BYOP (Bring Your Own Pizza) supplies and put together your own creation on Friday evening in the bunkhouse kitchen. There are two really nice ovens you are welcome to use to make pizza. The PORC folks did this last year and had a ton of fun. There's a bunch more ride-on-your-own time this year too with nothing planned for Sunday but recovery from Saturday and ride when you feel. Almost gone! 5 spots left for the BASH. Get them before BikeReg shuts down. As of today, there are only 12 spots left for the Last Bash. Just as a reminder, when we hit the limit, registration will be closed and we will begin turning folks away. If you haven't already registered for the 2011 BASH and had planned on doing so, you better do it quick. We've hit the maximum of 150 and decided since this is the last bash, we'll go to 200. We only have 38 slots remaining with just over two months until the BASH. When the entries hit 200, we will be officially closed. So get your entry in before it closes. The LAST BASH Registrations Keep Rolling in. Right now, the count for the LAST BASH is at 139 with two months to go. Each year, we cap the registrations at 150, but this year, since its the last year, we'll make an exception and cap it at 200. 200 is a FIRM number. When we hit 200, we truly will be shut down for any more entries. Registration is on the sidebar. Mountain bikers are a caring, good bunch of gents and gals. We see it at the Bash, at other events, races, and I witness it numerous times on the trails. They care about each other, about the trails, about the event they are at. They aren't afraid to chip in, help out, share, or lend a hand. They remove tree limbs, ramp up logs, and will stop and take a minute to do a little trail maintenance. I even know a couple guys who will carry a small folding saw with them to do some maintenance while riding. Today, I saw no less than 5 or 6 trees that were chain sawed to get them off the trail. Someone took a bunch of time to walk all of Fawn Kill (about 3 miles) and also got a huge tree on Doc Smith. THANK YOU. You know who you are, but I don't know who you are or I'd send you a personal thank you. Mountain bikers ROCK!!! Thanks guys and gals - you're all the best. RIDE ON! No ice, snow, or even gushing water at this point. Just a couple trees to hop over every now and then, but hey - that's mountain biking! Hello springtime - nice to have you. If you ride on Sunday, March 13, be prepared to get wet. 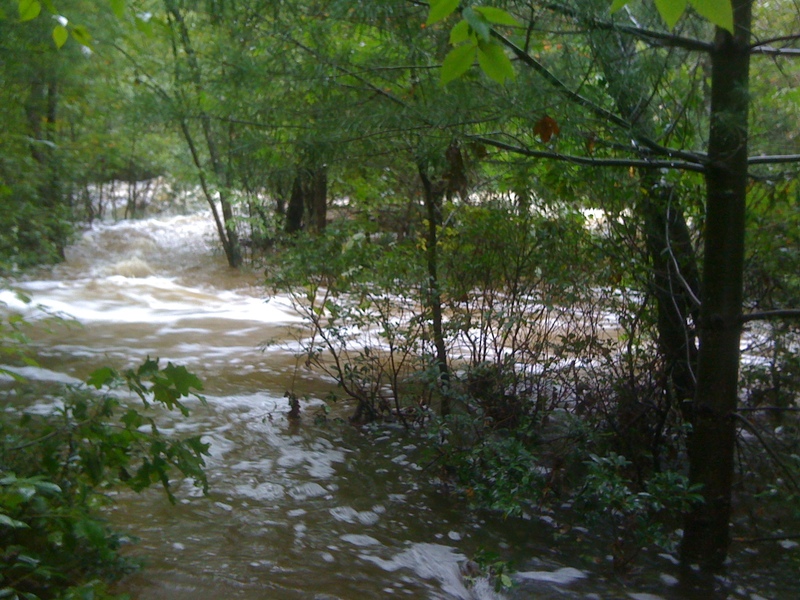 There's some serious water flowing in the woods and all those runs that are normally dry, are now true runs. Rattling Creek trail is very wet and there's many sections of the trail that the water is running straight down it. 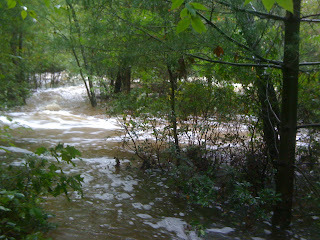 The trail normally flows beautifully, but today its flowing with water so beware. There's still snow at spots on the trails and the fire roads and snowmobile trails are thick ice. I can't tell you not to ride 'cause there were some hearty souls on the trails today; but I didn't last an hour on the ice and in the 4-6ish inches of snow in some of the low lying, shady spots. Its like a different world in the woods. I left home with temps near 40 and it was 28 degrees in the forest. I'll keep you posted. It's official. The final episode. The last chapter. The end to the BASH is near. This September will mark the last year for the annual BASH. After 12 years of organizing, we're calling it quits. There's a couple changes for this year: no Chili cook-off on Friday night. Our entries were down; thus, not enough food! We're tossing around other ideas for Friday night dinner -- maybe a pizza party in the bunk house. And there's no Rock's Ridge nor Hill Climb for Sunday. It's a free day to do as you please. Everything else is the same -- Camp Muckleratz, Gonder's Grub House on Saturday evening, entertainment both Friday and Saturday, the beverage wagon, organized rides on Saturday, same $45.00 registration. Oh, and we're giving you a t-shirt with registration for the LAST BASH too. Can you guess what will be on it?? So sign up here and be one of the 150 final attendees.